First, let me say that I am 100% in favor of trade. Trade is when we do what we do best, they do what they do best, and we trade. Trade, done right, will raise living standards. If trade is good, then free trade must be better, right? So consider this old joke about "free trade." Twenty years after NAFTA we can add that it doesn't work. It's bad for millions of workers, families and communities around the world. "Free trade" is not free. Our free trade policy encourages production to leave the country. We've lost millions of manufacturing jobs. More than 60,000 manufacturing plants were closed between 2000 and 2010 as production moved overseas. These costs are real. "Free trade" is not trade. Basically, trade is when each country makes things of value for export and gets things of comparable value in imports. In modern globalization, other countries manipulate their currencies, use tax strategies that distort exports and imports, and apply effective well-designed industrial policies to build manufacturing capacity. They export more products to us, and import fewer products from us. 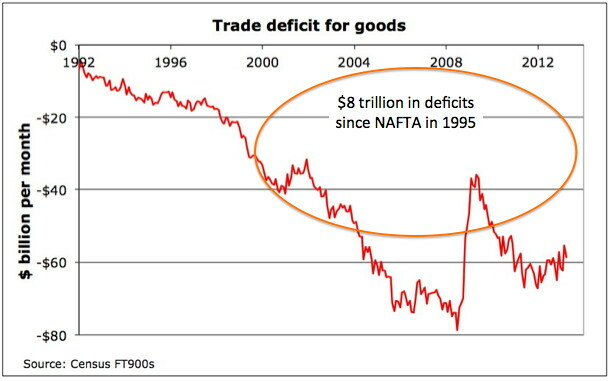 Our trade deficits since NAFTA are over $8 trillion. With trade deficits this large, we are not trading. We are letting other countries produce for us. We borrow, de-industrialize, and ultimately fail to capitalize on future production opportunities. That's not trade. That's getting picked clean. Figure 1. Since NAFTA we've consumed $8 trillion more in goods than we produced. Additionally, language in trade agreements is not about "trade," so much as protecting investors. The most charitable explanation I've heard for this is global businesses need strong "rule of law" in countries with weak legal systems. They can't risk investing in Mexico, Peru or Jordan if their property could be taken from them. Patents and intellectual property must be protected from modern global piracy of one form or another. OK. Sure. Investors need rights. In America, we solved the problem of protecting investor rights. We created rules for commerce among the 50 states. We innovated and helped investors prosper, AND we protected clean water and clean air AND we made social investments in schools, roads, power, arts and sciences, AND we set labor standards so workers could share in gains from productivity. Well, until recently, arguably. The European Union also solved that problem, protecting investor rights among their 17 or 22 or 27 countries or whatever that number is, AND they invest in research and development AND educate their children AND promote sustainable energy AND share the gains from productivity with workers. Well until recently, arguably. Modern democracies built policy solutions over generations of political engagement. We achieved an upward spiral, raising living standards for the most part. However, free trade agreements pursue a very different political process, driven by global companies, and aimed primarily at investor interests. Free trade agreements are bad for millions of people because they are not really about trade. More importantly, they limit the political process so investors are relieved of responsibility for protecting the environment OR recognizing labor rights or human rights, OR dealing with public health OR worrying about prudent financial regulation. The overall result is downward pressure that weakens our political and social values, eroding civil society and public interest in all countries. Joseph Stiglitz, a Nobel Prize laureate economist, calls "free trade," global governance without global government. Companies have filed over 500 challenges to public policies under trade agreements. In that respect, free trade agreements serve as a Corporate Bill of Rights. Richard Eskow calls "free trade" 21st century colonization where global corporations and global financial institutions displace national governments when setting policies. Free trade agreements are the global equivalent of Citizens United - amplifying the political influence of the wealthy. My Congressman made a compelling argument for public interest, based on his personal experience as a doctor in Africa. Global pharmaceutical companies use patents to charge prices far above market levels. We expect a public good in return. This goes horribly wrong when millions of people with treatable diseases are denied access to life-saving medicine because trade agreements favor investors over people. This is exactly the kind of question we want elected officials to resolve. That's why we have democracies. Instead, under "free trade" agreements, a trade tribunal will make those policy decisions for us and for millions of vulnerable people around the world. These shadowy tribunals will enforce rules written into "free trade" agreements, which are all about investor rights, not about trade and not about public interests. Show me language in free trade deals that protects the environment. Show me language for worker standards. Show me free trade provisions for human rights, public health. Here's an easy one - show me any action to stop currency manipulation, which distorts trade, subsidizes global companies who produce offshore, and makes a mockery of any textbook principles of legitimate trade. We are negotiating two giant new "free trade" agreements, which are not about trade. They are about global governance. One is called the Trans-Pacific Partnership, or TPP. So far, 11 Pacific-rim countries will be included. The other huge deal is for Europe. The defining characteristic of these agreements is that investor rights will have priority over public interest. They weaken Democracy. They are not really about trade. If the TPP and the European deal are signed, we will have locked in this new 21st century colonialism for generations to come. It was never really about trade.